The Teck Crescent Tiara came from Queen Mary's mother, The Duchess of Teck, who in turn created it from jewels inherited from her aunt, Princess Mary, Duchess of Gloucester. It ended up in the possession of Queen Elizabeth (the future Queen Mother), likely given to her by Queen Mary. It includes three wild roses and twenty crescent shapes in diamonds, with each element able to be removed for use in a brooch style. The tiara was inherited by The Queen when The Queen Mother passed away, in 2002. 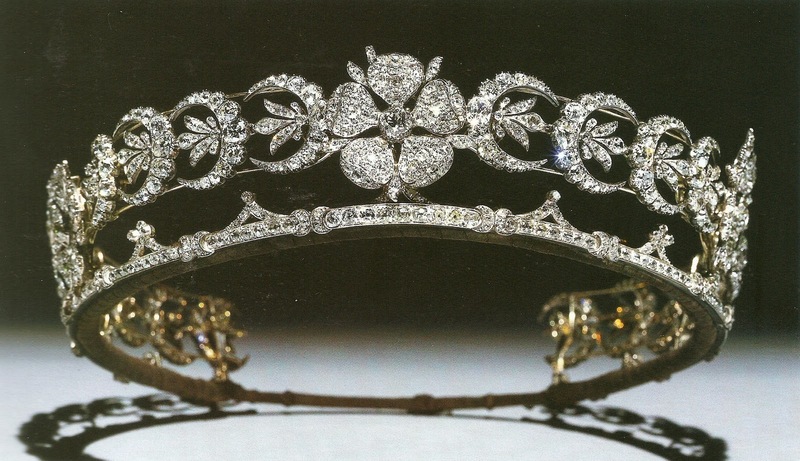 According to The Queen's Diamonds by Hugh Roberts, this tiara has been loaned to The Duchess of Cornwall, though we have yet to see her wear it. It hasn't been worn in public for decades, perhaps not since the 1940s.